One of the rumors surrounding Apple’s WWDC 2012 announcement agenda, and certainly the one which has gained the most traction over the past few weeks, is that at least some Mac computers will get a Retina display. Apple already uses Retina displays, so called due to both their high resolution and high pixel density, on its iPhone and iPad range; making it a logical step to start including them on Macs. In this case, Retina is expected to come to 15-inch MacBook Pro models, and the MacBook Air. A check of FolderWatch’s website reveals the same thing — that version 2.0.4, dated June 7, fixes some bugs, adds some new features and right at the top, provides Retina graphics. 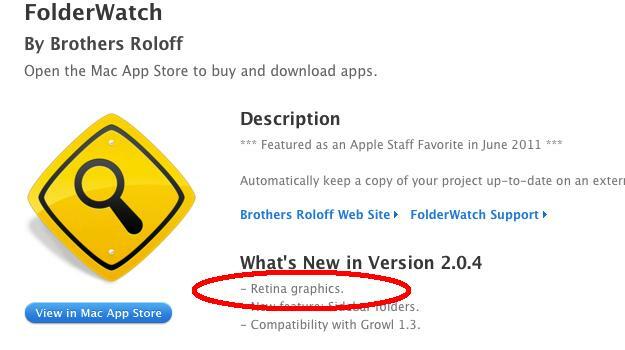 The developers of the app, Brothers Roloff, tweeted that “Apple just approved FolderWatch 2.0.4, the app is ready for retina displays” early this morning too. A mistake on their part can certainly be ruled out, and we’ve approached them for a comment. A new screen isn’t going to be Apple’s only update to the Mac during WWDC 2012, should the reports prove accurate, and it’s expected to bring big changes to the vast majority of the Mac range, including new designs, faster processors and possibly a brand-new iMac too. WWDC will also likely play host to iOS 6, the next version of the company’s mobile operating system, which could introduce new in-house 3D mapping software, Siri on the iPad and perhaps tighter integration of Facebook too. The event begins on June 11, and should the Brothers Roloff respond on the subject of FolderWatch’s Retina boost beforehand, we’ll update here accordingly. DT Debates: Should humans go to Mars?